Our 130 Starfire GTX refractor ushers in a new era focuser…the 3.5” Astro-Physics focuser with a greaseless drawtube and the dual-speed mechanism of the Feather Touch 9:1 Micro. The focuser has been designed to meet and exceed the high-precision requirements of modern imaging. Today’s smaller pixel cameras can magnify any focuser flexure problems, so we have engineered this focuser from the ground up, reviewing every part so that even the heaviest cameras will be free from flexure and have focusing repeatability. More than a dozen knife-edge baffles are machined into the wall of the drawtube and painted flat black in order to maximize contrast by essentially eliminating any internal reflections. Visual and imaging astronomers often want a different “feel” to their focusers, as their requirements differ. Adjusting the “feel” of the focuser is easy. There are two adjuster screws located on the underside of the housing. By slightly tightening or loosening the screws one changes the resistance that is felt when turning the focuser knobs. They should be adjusted equally. The rotatable-focuser style is incorporated in its design. The “captain’s wheel” locking collar is loosened to rotate the focuser and then tightened to lock the focuser at any chosen angle. To remove the focuser, one simply unscrews the collar completely. 130 StarFire EDFGT: The "Gran Turismo" can be easily upgraded to the 3.5” focuser, as they both incorporate the same design and thread size. Simply thread one off an the other one on. 130 StarFire EDF and EDT or the 155 StarFire EDFS or other Astro-Physics refractors with 2.7" focusers: At this time, they cannot be upgraded, however, we are exploring the possibilities. 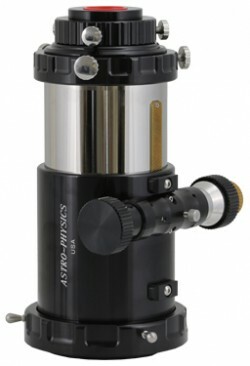 The focuser is also available for people who are building their own scopes. Flexure-free, repeatable focusing when used with the heaviest cameras. Rotating focuser “captain’s wheel” collar easily locks and unlocks the collar to frame your photos for optimal, artistic composition. Focusing scale with “mm” graduations that will enable you to return to a particular position easily. Allows use of the Quad Telecompressor Corrector for wide and fast imaging. An endcap screws onto the focuser drawtube and can be locked into place using three set screws that are found in the endcap’s surface (this is an optional action that imagers may want to use). The endcap terminates in a 3.5” circular dovetail which ensures absolute orthogonality for your imaging needs and allows you to quickly swap accessories or cameras. The male threads on the drawtube onto which the endcap screws are 4.100" x 24. Three adapters are provided: a 3.5” circular dovetail to 2.7” AP thread, a 2.7” AP thread to 2” compression and a 2” to 1.25” compression. A digital focusing system is available for imaging automation. Visual observers may also enjoy using the available hand paddle with the digital system. The focuser has 4.5" (115 mm) of travel and with adapters weighs 6.9 lbs. (3.14 kg. ).